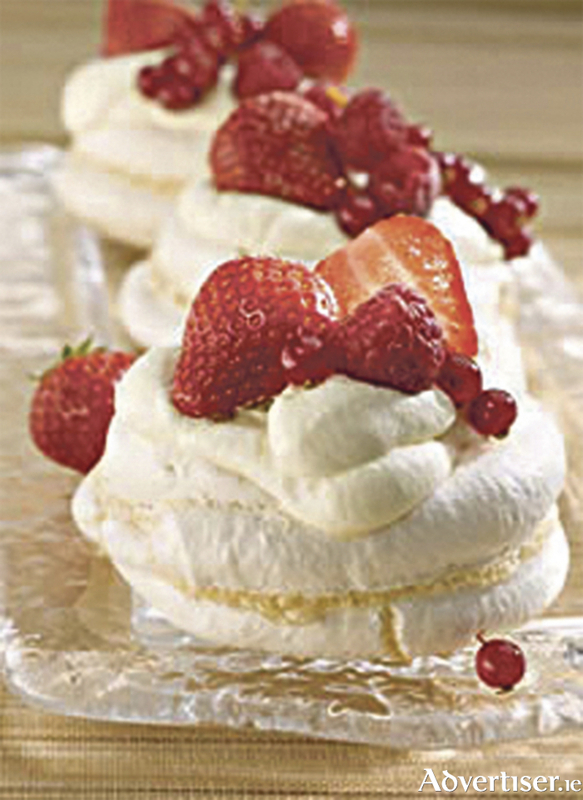 Now that the nice weather has hit, it is time to introduce something sweet and fruity to your everyday diet. And with this delicious recipe from Bord Bia, you can enjoy a tasty, fruit-based dessert and still feel like you are eating healthily. Set the oven to 100ºC and line two baking sheets with parchment. Combine the egg whites, sugar, vinegar, and vanilla extract. In the electric mixer, with the whisk attachment, beat the whites into stiff shiny peaks. Using a piping bag, pipe mounds of meringue 7cm in diameter and 7cm high onto the baking sheets. Bake for about two hours. Prepare the fruit and add half the berries to a medium saucepan, add the sugar and lemon juice and simmer gently for five minutes. Process the fruit mixture and set aside. Whisk the mascarpone, yoghurt, and lemon rind together. Tap the centre of each meringue to form a nest. Warm the coulis in a saucepan. Turn off the heat and add the remaining whole berries. Spoon the cream filling into the centre of each meringue, followed by several spoonfuls of the fruit.